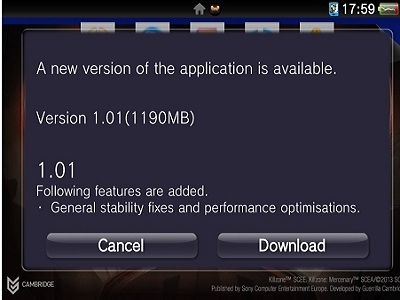 An 1190MB stability patch will increase Killzone: Mercenary's total file size to about 4.5GB. Killzone: Mercenary has arguably been sold as something of a game changer for the Vita. Consistently touted as a premier on-the-go shooter it's probably one the most anticipated releases coming to Sony's handheld in the near future. That being the case, gamers planning to buy the game digitally may want to reconsider a physical retail copy depending on the size of their memory card. While Killzone: Mercenary was going to be a large game to begin with (3.3GB), it's been revealed that the game will be receiving a day one stability patch that that will push the its file size up to around 4.5GB total. That, of course, would completely consume a 4GB memory card(and then some)and eat a sizable chunk out of an 8GB card. The patch itself will supposedly add in "general stability fixes and performance optimizations" that should help Mercenary run a bit more smoothly when it launches. Despite the obvious benefits of a well running game, this patch is nonetheless a reminder of why buying one of the handheld's larger memory cards is kind of imperative if you intend to do anything digital on the platform. That being the case, investing in something as expensive as the Vita's 32GB ($79.99) card is probably still a hard pill to swallow, even after recent price cuts made the handheld and Sony's proprietary memory cards more affordable.